The chill of the ice. The shouts from the fans. The explosiveness of the game. Sound appealing? Then perhaps you are a hockey player. And no matter what level you play on—youth or adult, amateur or professional—you can agree that hockey is an exciting sport, designed to create constant action. Why are Hockey Injuries so Common? There are many components—the ice, the puck, the sticks, the walls, the other players—which, in turn, means that ice hockey leaves a lot of room for injury, despite the protective gear you’re required to wear. Pucks, though small, make a significant impact when traveling at high speeds (sometimes up to 100 mph in professional leagues). Players collide with ice, walls, sticks, or each other. Defensive checking is a legal potential for injury. As a hockey player, how do you decrease your chance of hockey injuries and increase your game time? Practice and conditioning build strength, endurance and skill that you need to nail that shot or to check that opponent and to do so safely. For instance, in amateur hockey, back pain is one of the most common issues. This can come from the forward posture of skating, which can strain the lower back. Doing exercises to strengthen the back and the abdominal muscles will help you hold that posture with fewer issues. But, when injury already exists, it’s challenging to prevent further strain. For this reason, it’s wise to create a post-play routine that will help you recover and strengthen your muscles. This should include stretches that will increase flexibility. Electrotherapy accelerates rehabilitation, using electrical impulses to interact with muscles and nerves. Transcutaneous electrical nerve stimulation (TENS) is a natural painkiller that uses these electrical pulses to block pain signals from the brain. Electrical muscle stimulation (EMS) stimulates the muscles, which strengthens and aids in recovery. 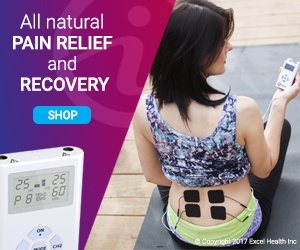 Portable options like iReliev’s over-the-counter TENS+EMS combo muscle stimulator system can even be worn under the shirt during training, so that your aches and pains don’t keep you from correcting your pass. You should keep the same kind of routine in mind all across the board. Be sure to give extra attention to areas that have it especially rough on the rink. For example, shoulders are constantly taking and giving hits and will benefit from electrotherapy before, during or after a game or practice. The groin and hip area is constantly in use during the skating stride, and should be stretched and tended to carefully. Your knees and ankles are under strain again and again as you push off from the inside edge of your blade, stop or transition. Strong knees and ankles are invaluable in hockey. Remember to stay away from pain pills, whether over-the-counter or prescription. In the long run, these won’t contribute to your improvement, and will only cause you potential harm down the road. Stay proactive about your strained muscles or other injuries, use TENS+EMS Units to relieve pain and bring support during or after practice and never neglect stretching. If you incorporate these rules as an athlete, your chances of staying off of the bench and on the ice will be much higher. 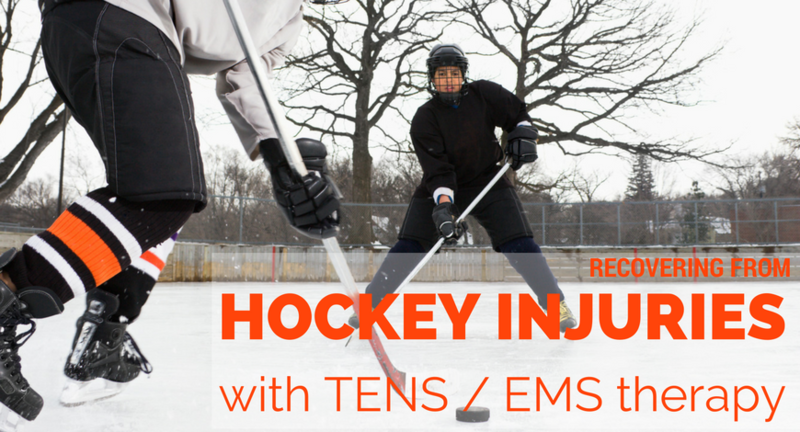 Find out about how our TENS+EMS Units can relieve pain and speed recovery.